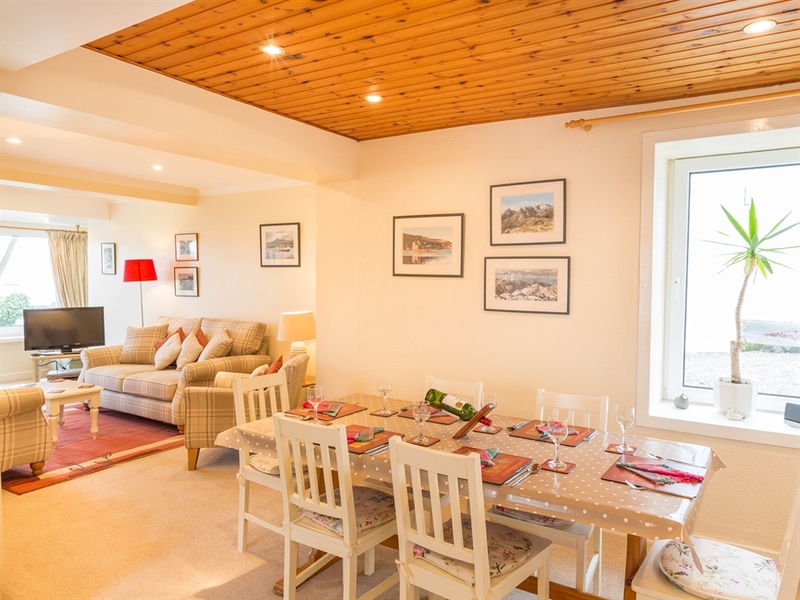 Woodside has stunning views across the bay towards Holy Isle. 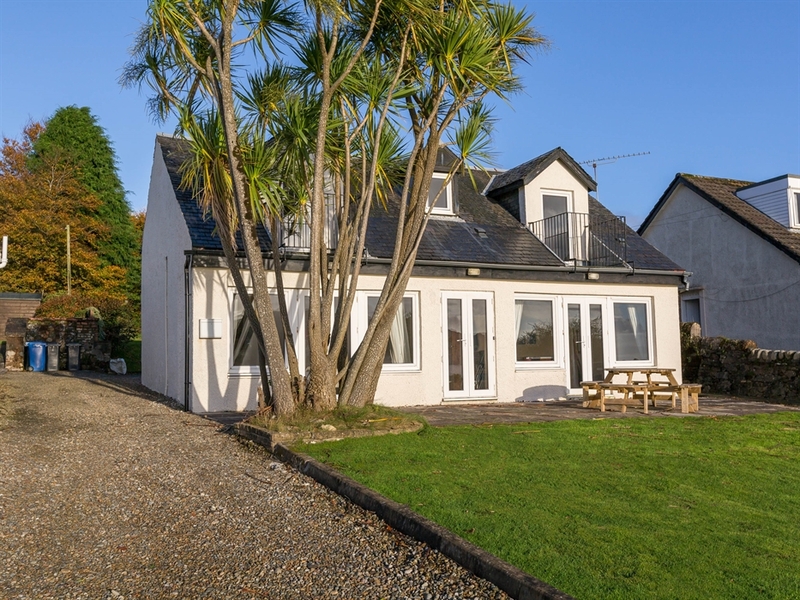 It is situated in one of the most idyllic locations on Arran. 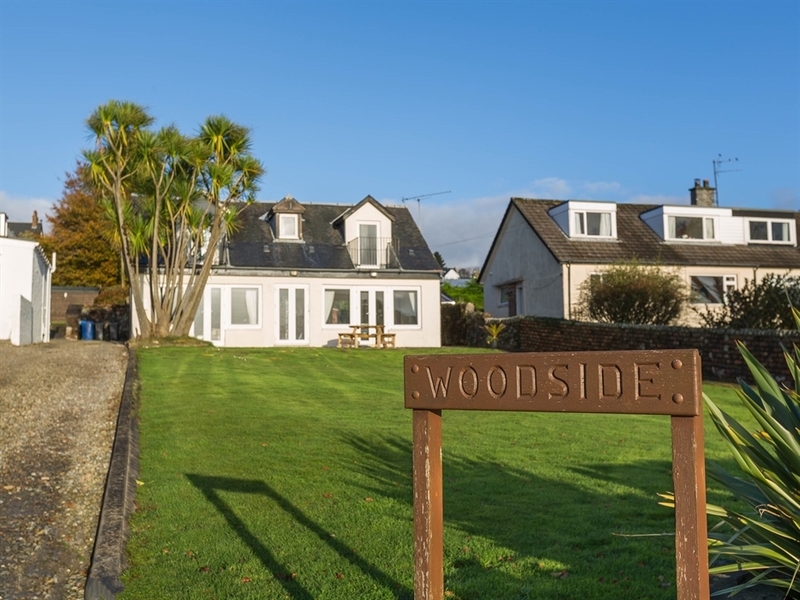 With its spectacular views across the bay towards Holy Isle, there are few more idyllic locations on Arran than that occupied by Woodside. 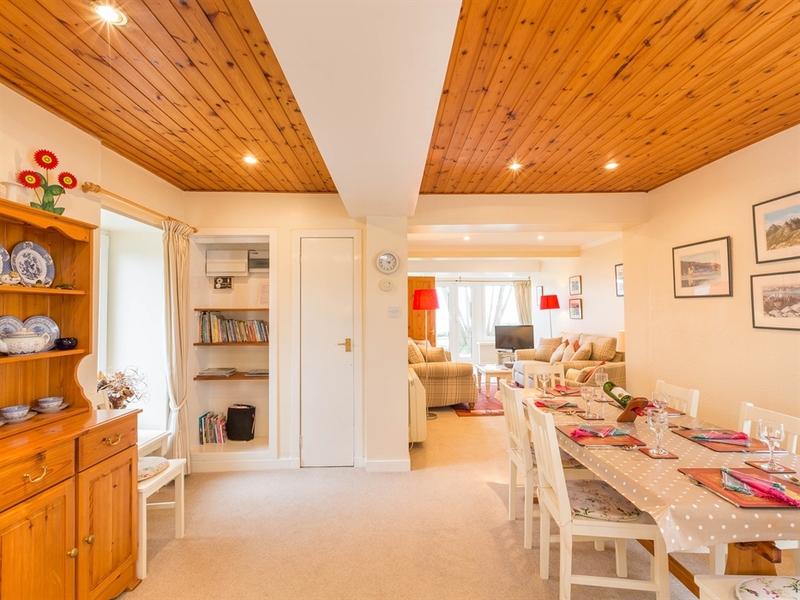 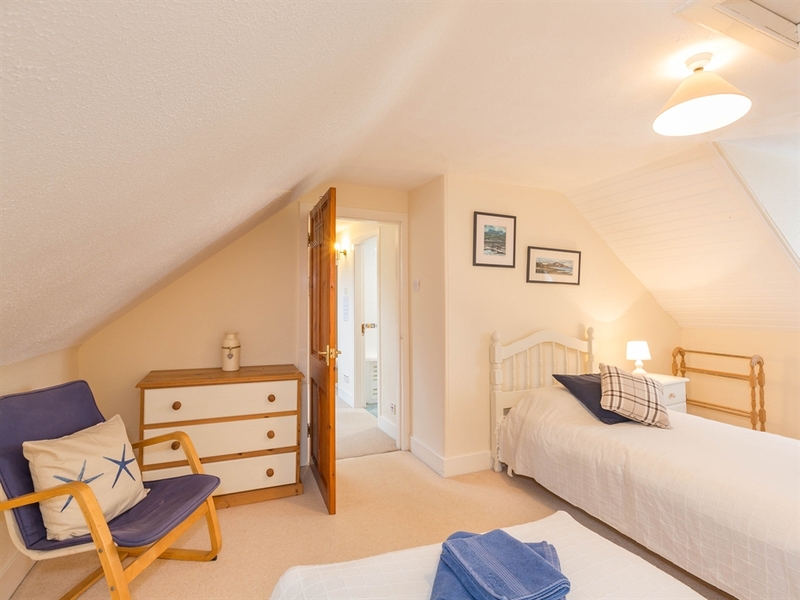 Just a stone’s throw from the beach and only a short stroll into the centre of the village, this large and comfortable family home offers the perfect base from which to explore all of the island. 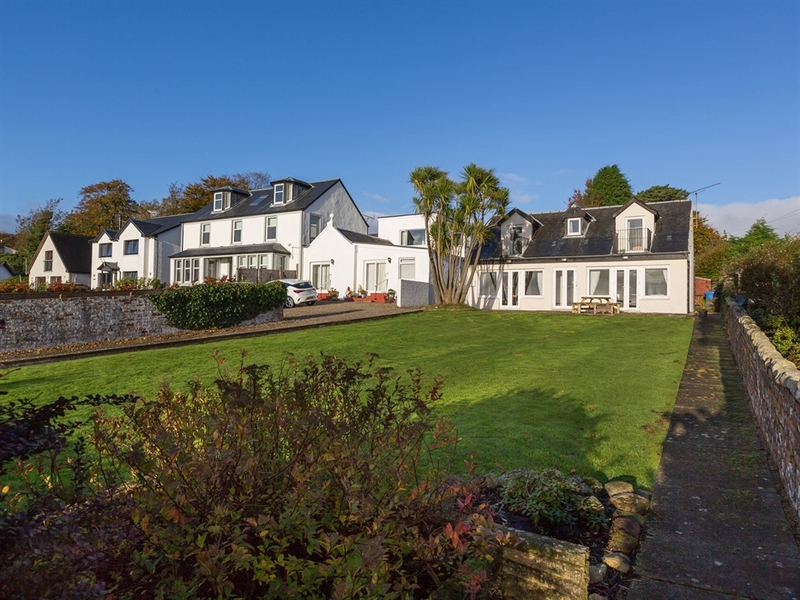 Woodside has undergone a significant ‘refresh’ during 2017. 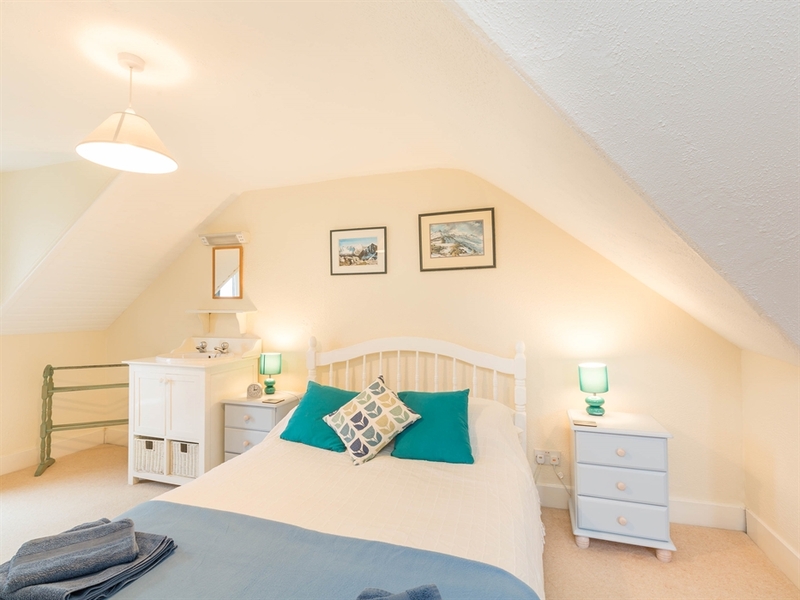 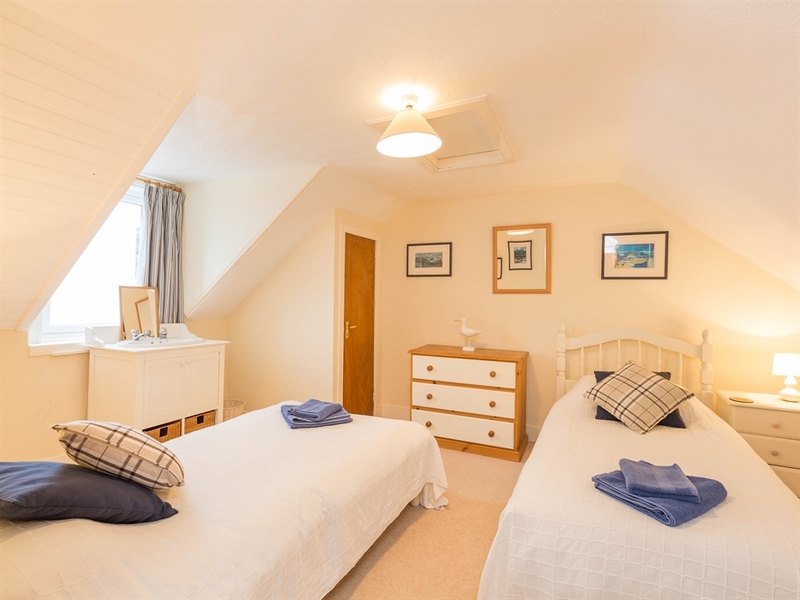 Completely redecorated both inside and out, with many rooms refurnished or with new soft furnishings, the house now has a bright, airy and altogether more contemporary feel. 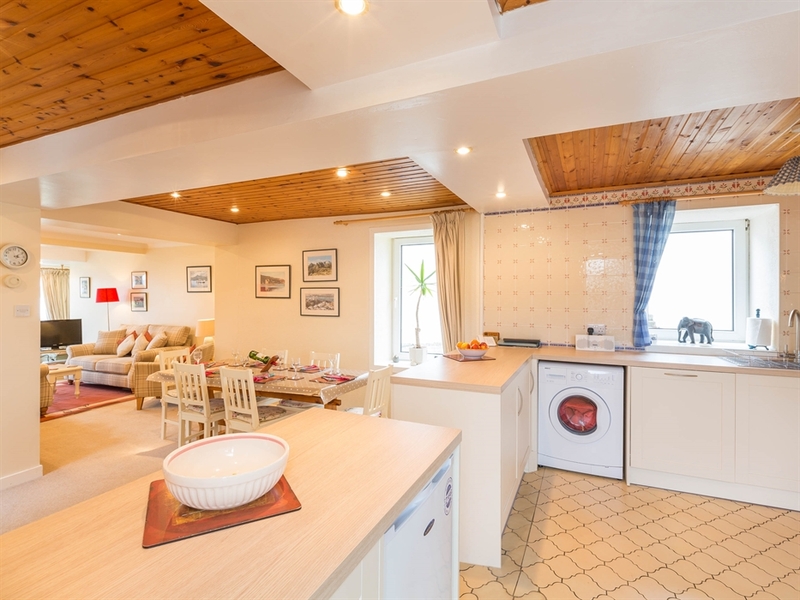 The newly fitted kitchen is well-equipped and gives the open plan living and dining area a light and spacious feeling. 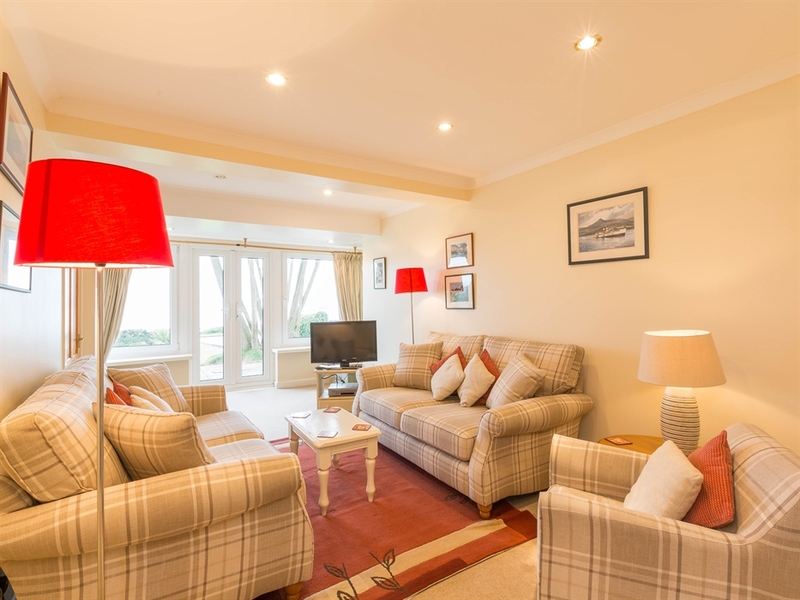 South facing windows make the most of the natural light as well as uninterrupted panoramic views to the Holy Isle. 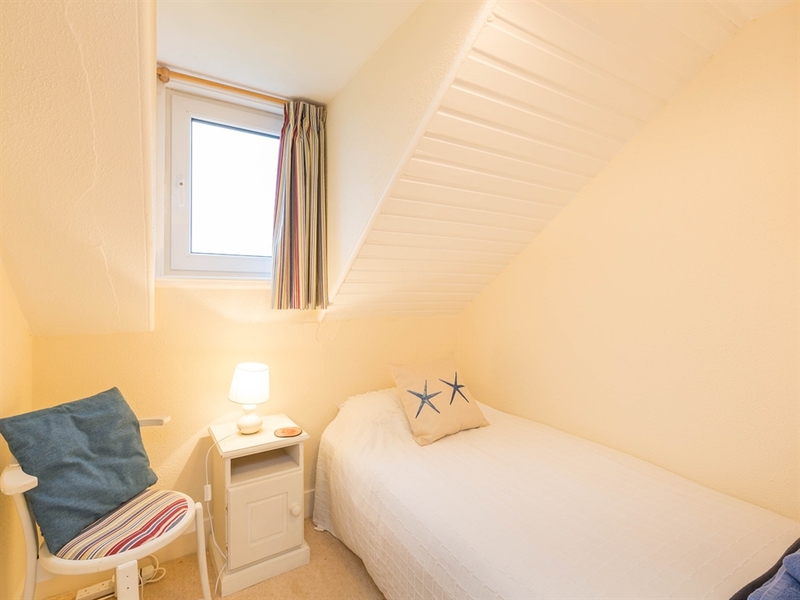 The sunny patio is the perfect spot to sit and have a morning coffee or perhaps a glass of wine before supper in the evening, watching the ever-changing colours of the sea and sky. 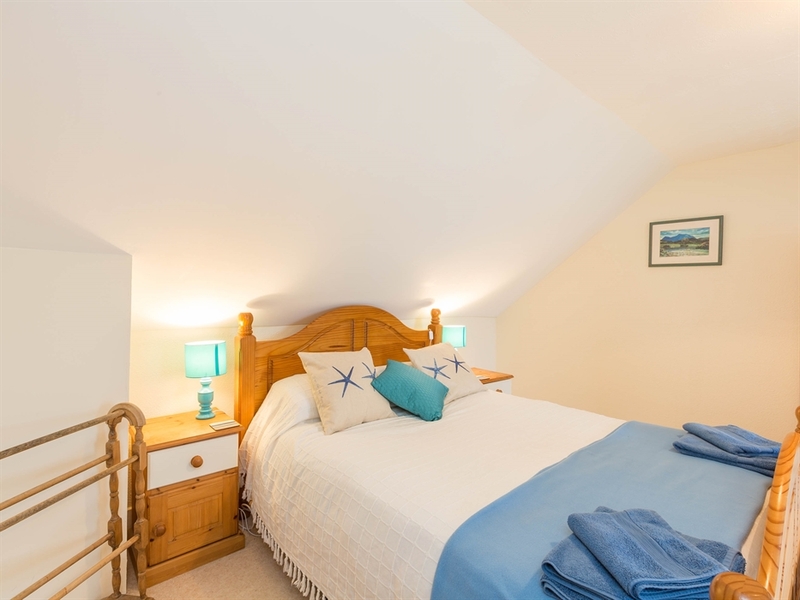 The house itself is situated along the shorefront, sheltered by palm trees, and with easy access to the marina. 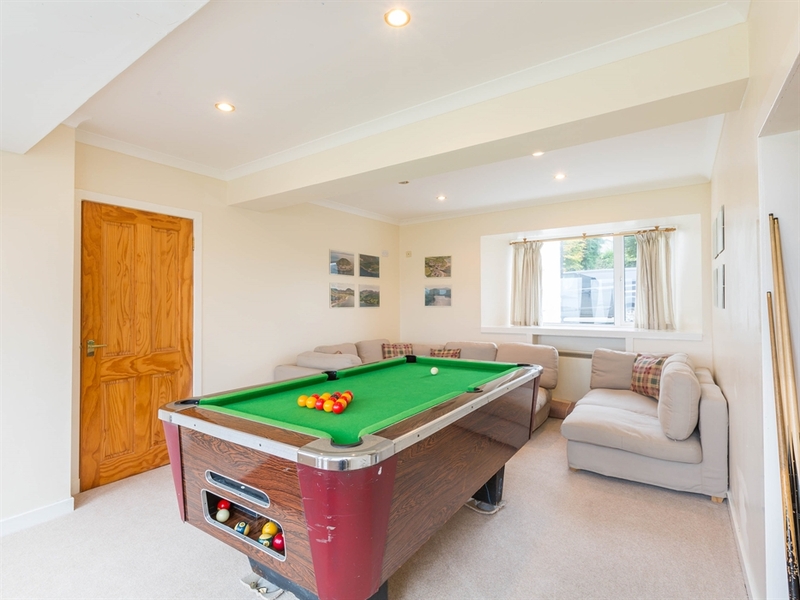 Ideally suited to families, Woodside boasts not only a pool table but also two large gardens both front and rear, which allow visitors to take advantage of the sun all day. 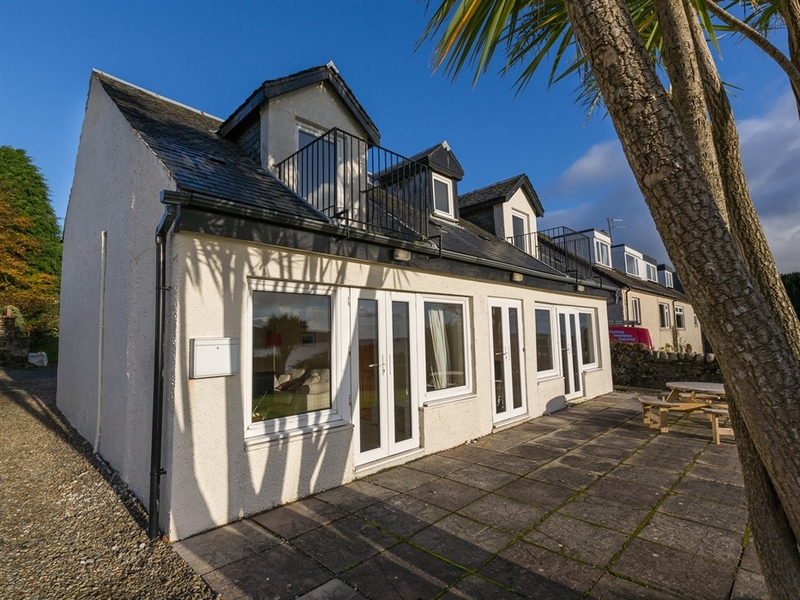 All of the rooms at the front of the house benefit from the wonderful views out to sea and guests will be able to enjoy spectacular sunrises, as well as pass the time watching the boats sailing into Lamlash Bay, enjoy the frequent sightings of herons and seals or even be lucky enough to spot a pod of dolphins or porpoise. 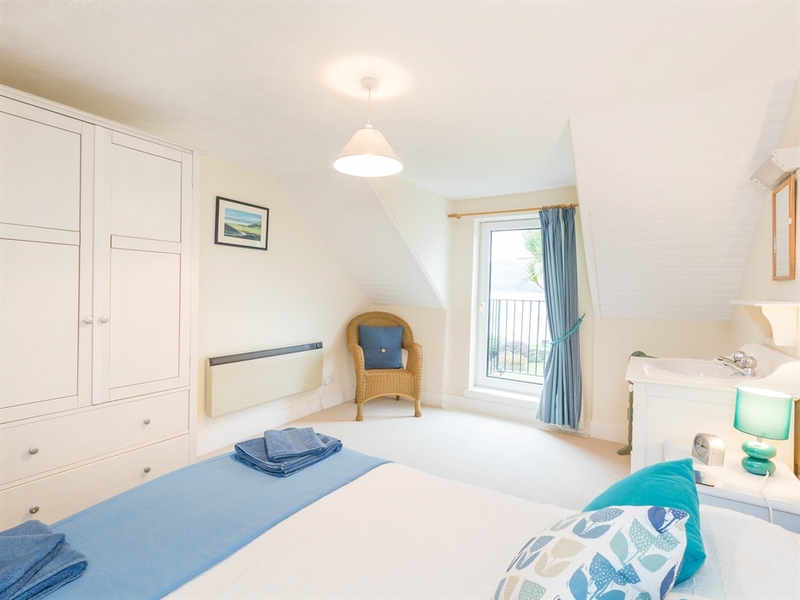 The house will appeal to those wishing to relax in a peaceful haven with unrivalled views and beach access. 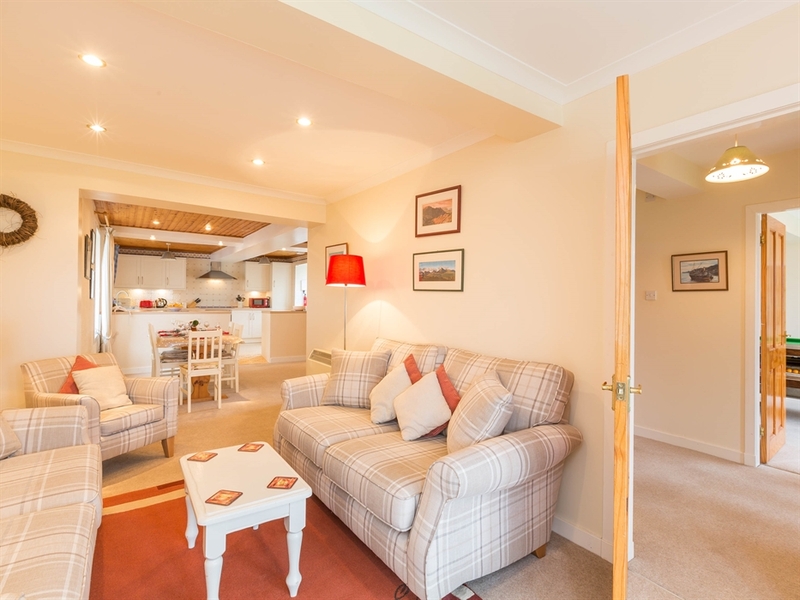 Located just 3 miles from Brodick and with very easy to access all that the Isle of Arran has to offer, Woodside offers the ideal location to base your holiday. 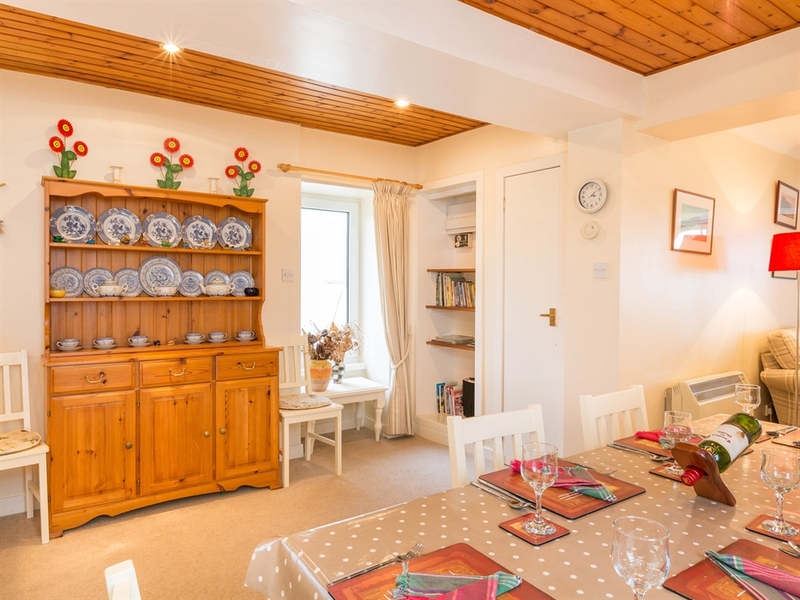 From beaches, scenery, wildlife and walks, to the numerous historical site, as well as the mountains and distillery in the north. 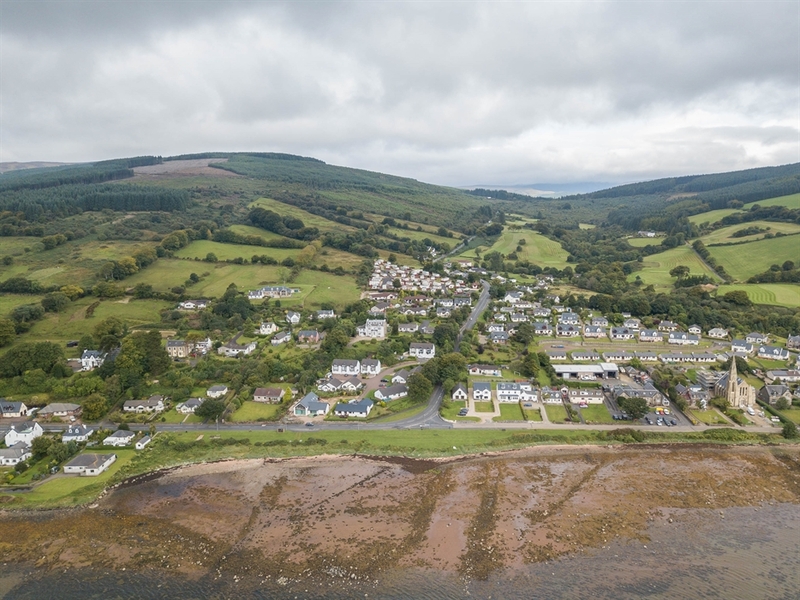 There is also a golf course in Lamlash a short walk away, as well as an outdoor activity centre offering pursuits such as sea kayaking and canoeing. 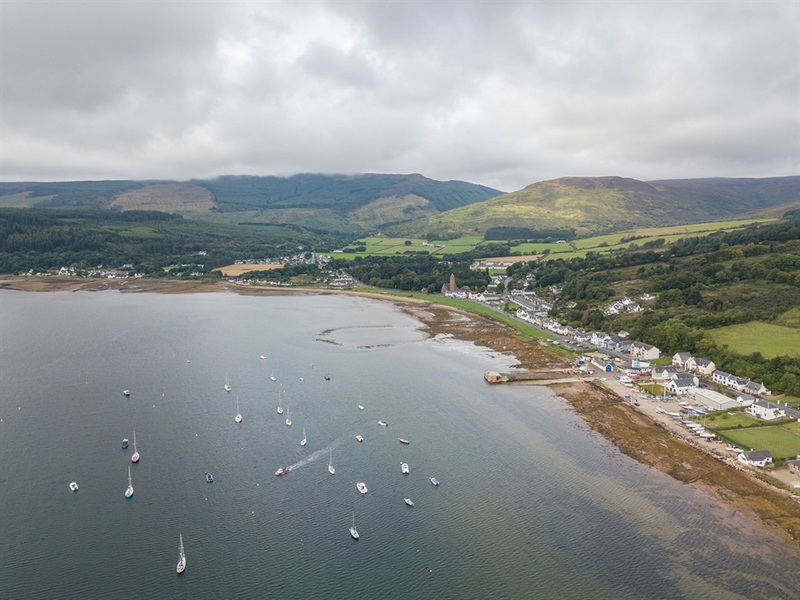 For those looking for a more leisurely stay, Brodick, Lamlash and Whiting Bay have a wide range of gift shops, galleries, restaurants and specialist food shops and there are beaches all round the island, particularly in the south and west. 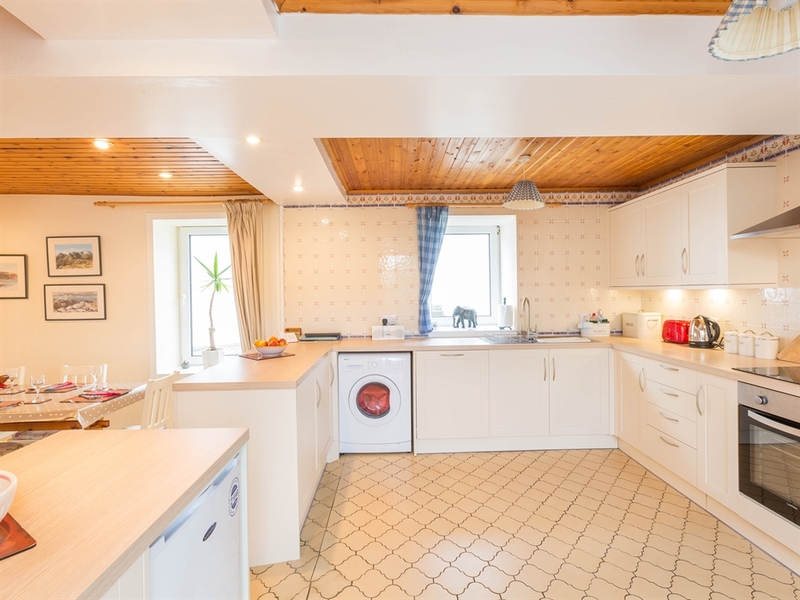 There is also a supermarket in Lamlash just a short walk from the house, as well as numerous tearooms, restaurants and coffee shops. 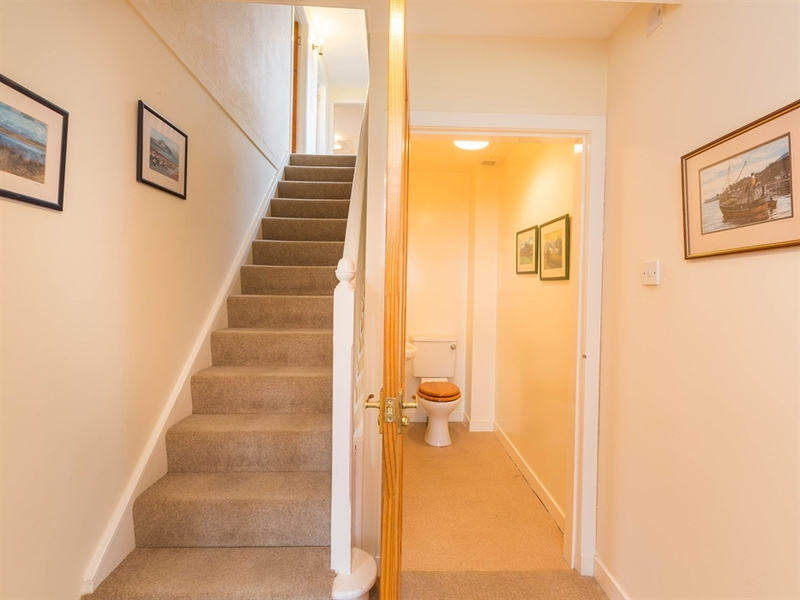 Entrance from the front garden through the front door into the hallway leading to stairs, pool room, downstairs toilet with hand basin and sitting room/kitchen/dining area. 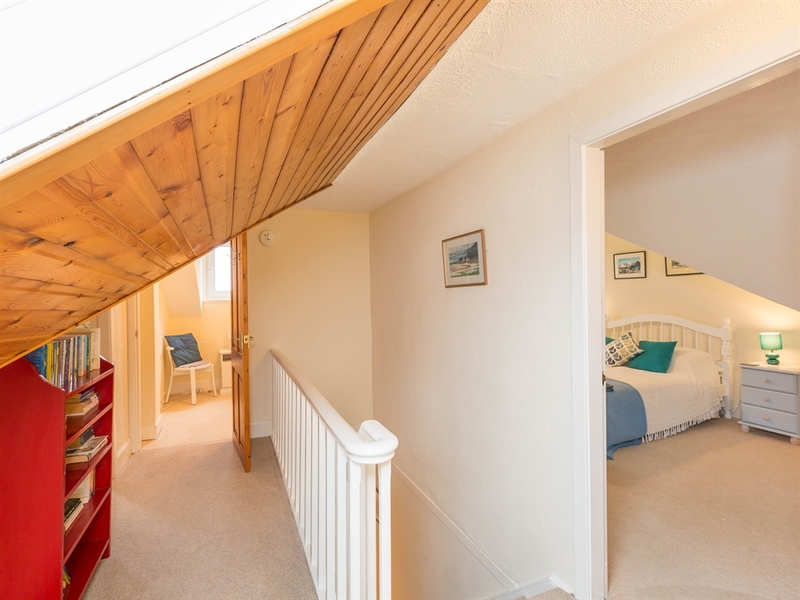 Access from the kitchen to the back garden.Stairs leading to landing. 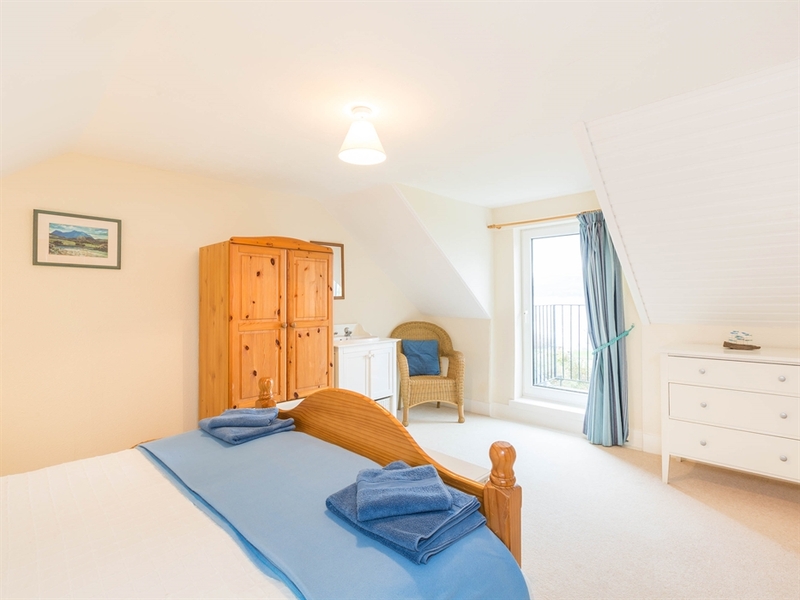 2 double bedrooms, 1 twin bedroom and 1 single bedroom. 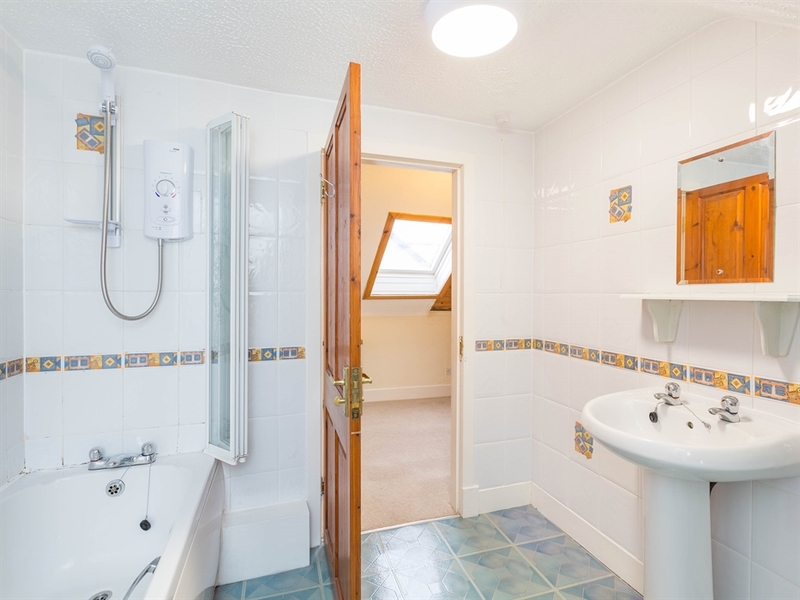 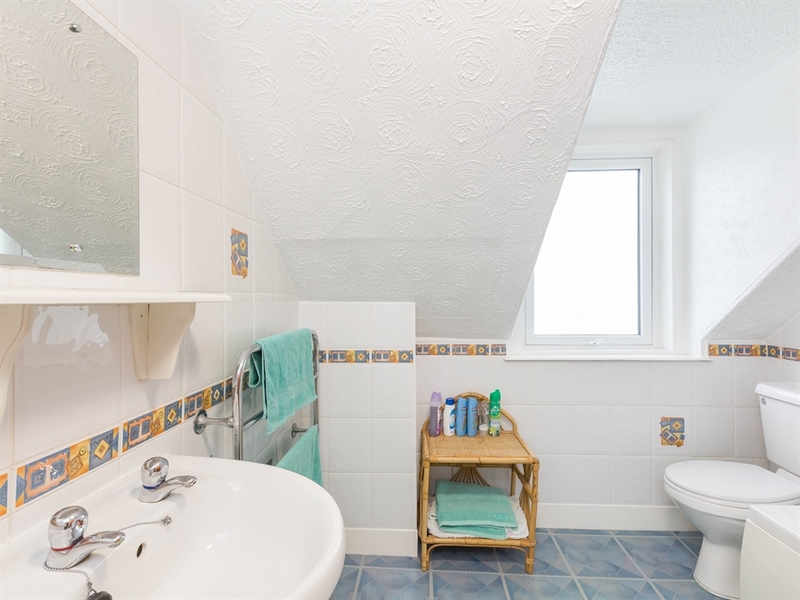 Family Bathroom: bath with shower over, WC & WHB.